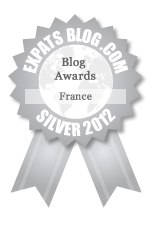 ExpatsBlog.com Expat Blog Awards 2012: France Silver Award! This blog won the Silver Award for best expat blog in France! Chic!! I like your cosmetic reviews and Louis Vuitton post!! I love you Cosmetics & Sunglasses post :) This deserves a 5Star rating! i love ur post about...3 PLACES I WANNA VISIT BEFORE TURNING 30. two thumbs up!!! Im a regular reader and following your blog via bloglovin. Your words are very light and at the same time inspiring. I love Paris a lot and so is your blog!!! Your blog always give me a fresh feeling, it is not the typical expat blog where writers post all their complains in their new life and new country... yours is totally different! 5 stars over all. Good layout design and great content! I just discovered your blog and Im totally hooked. Merci for sharing your little paris, beauty, etc. Im loving it to bits!! Its a must-read for every girls!! You made a good job... Keep it up! I'm living in the north of France and originally from UK... I'm glad that I found your blog. I like the variation of topics... Your blog is not always about YOU but the woman in you which I like the most. I always look forward to your adventures and tips! Lavet! I love your blog about 3 places you wanna visit before turning 30. It' really inspiring, made me realized that we should strive for maximum excellence to achieve our goals and visit places that we have been dreaming of. This blog is very informative and very entertaining to read!!! Fabulous! If Coco Chanel believe that "A girl should be two things: classy and fabulous." Me , believes that A BLOG SHOULD BE 2 THINGS: CREATIVE & INFORMATIVE. Thank you for sharing your little Paris with us!! Good luck on your journey and may you continue to inspire every woman. 5 STARS!! Your blog about beauty and fashion are very helpful. I love your every post actually. :) keep it up! The best thing about your blog is you are still supporting the Philippine local brands even you are now living on the other side of the world France! It is something really nice and unique for a blog. Continue sharing your thoughts.. It is very inspiring! Awesome blog! Topics are very girly yet informative! I always get few tips from this blog! Keep it up! I agree with the other comments. This blog is fun and exciting to read, it never bores me. I would like to live in Paris too one day! 5 STARS! Cheers! This blog is young and fun! It gives positivity especially for women. New blog yet very encouraging and full of pretty things! I love it! Thank you for sharing my dear!! Paris doesn't seem to far because of this blog! :D Good read and a must-read for all chicas! Fun, young, exciting, and informative, all into one blog, it's a must-read! I adore how you still support your local Philippine brands, I find a lot of humility by doing so. I wish you a good adventure not just in France but in your wonderful life! Good luck!! This blog is promising, considering that it is very new. It's young and fresh, the topics are helpful and the blog layout is very cute! Good job Cynthia! Continue inspiring people!! I am happy to stumble on this blog a month ago. I like the helpful tips for beauty and other little things. The author is fun, witty and awesome woman! Continue writing and inspiring girls. Very chic blog just like Paris! Cheers!! 5stars!! Just drop by to give 5 stars to this not-so-typical-expat-blog! I always enjoy reading this blog!! Very girly, very me!! My daily dose of Paris and beauty comes courtesy of from Paris to Pureza. This blog makes me either go in Paris or go shopping! Haha!! Best blog for girls!! Awesome blog! You made me realize that it is fun to be a woman and made me wanna go to Paris now!! This blog is totally different among other blogs listed here.. Topics are fun and girly.. It's like visiting Paris in the weekend, and cosmetic shopping during mondays and tuesdays. Hehehe! I just love everything..
Every girl will love this blog!! Fun, helpful and exciting topics!! 5 stars for chicness! This blog is very informative especially for girls! I admire Cynthia for being witty talking about Paris, the French, France, beauty, makeup, travels. I like everything in this blog, clean and fun! I like the layout too! I only discovered this blog last week.. Now subscribed to get updates. I like it so much and thought of dropping a line here! Definitely a must read! Paris and everything!!! I am a secret admirer of this blog, like a lot of people who reads and never put a comment. Maybe because I am saving the comment here! Hehe! I like this blog because it's "girly" as many described it. It is feminine and chic, it is new and promising! You got my support dear! I found myself addicted to visiting this blog to see what's new!! I love Paris and all the things posted in the blog!! I am also impressed by the blogger who still support Philippine brands. It's something really humble, nice and refreshing! Keep it up! Looking forward for more posts!! Stumbled on this blog and started following it. Fab blog, awesome read! Keep it up! Thank you for sharing your Parisian beauty world!! Kudos!! 5 stars and a moon!! I feel lucky to have discovered this blog.. It is like a little treasure box for girls! A must read!! This deserves an honourable badge!! Good job!! France, beauty and women! Great blog for girls!! Preppy, pretty, and free-spirited.. These words are best to describe this blog. I like everything from beauty, fashion, paris and travels. 5 stars!! Keep it up! Basically I like that the author is still showing her love for her own country which just shows a lot of humility. I've been following this blog since the beginning and I really like how she address female topics, beauty and fashion. I also like her Parisian posts. 5 stars!! Like what they all say... This blog is extra-girly, extra-fun and extra-fab!! New blog yet already very engaging!! It must be the author's charm!! Heehee!! This blog is informative. Thank you for blogging about Virlanie and spreading the word! Continue being fun, witty with substance! Keep it up! 5 stars! This blog makes me dream of Paris and the South of France and of so much places! It makes me dream of a Parisian lifestyle, shopping at Sephora and Louis Vuitton, with a French lover! Hahaha! I love this blog's chicness! Kuddos ma belle! From Paris to Pureza is definitely a blog for all girls! I have been following since the beginning and I always look forward for new posts. It's fun, exciting and very woman. It speaks the personality of the author herself! I adore it very much!! I'm really glad to find this blog.. It's like a breath of fresh air. I love all the things written here, everything I can relate and dream of. I am now a huge fan!! ""some love and everyday daydream, plus little things in between"" I love everyday all the little things in between. I simply love your blog! Cheers!!! Im happy to give my shining 5 stars to this blog. Young and new.. I do believe that it still have a big room to share more informations. OUI I am excited for more! Discovered this blog because of this site... And suddenly fell in love with this cutesy blog! The author is a cutesy as well! Cheers!! More to come!! Just dropped by to show my love for this blog. Awesome posts and awesome author. Bravo et merci pour vous! If only I could give 10 stars, I would! Bravo for a cool blog like this! Ditto! I agree with all the comments, this is an awesome blog considering that it is quite new! It is exciting and promising!!! Like! You got my support my dear! I love your blog and always excited to read it everytime I get email notification. Superb! Making a life in France and yet still supporting the Philippine locals is truly outstanding. I admire you for that idea. I hope you continue inspiring women all over the world with your blog. Itâ€™s fun and informative. I want to thank Cynthia for this wonderful job! Keep inspiring and spreading love and positivity! Kudos and bravo for this brave woman!! 5 stars!! I am really excited and keeping my fingers cross Cynthia! Good luck!! Your blog deserves a spot! A big fan all the way from Nevada! !